One of the biggest challenges that your warehouse is going to face is finding enough space for everything that you need to store. When you start to run out of space, you could be left with two very expensive options: either move your facility or pay to expand it. They are both time consuming and can quickly eat up your budget. However, there is a third option that many warehouses fail to take into account, and that’s maximizing the space that you already have. There is an excellent chance that, like most warehouses, you aren’t making the most use out of the warehouse shelving you already have in place. You may have more room than you think and these tips will help you find the hidden space that you need, without devoting too much of your and money to the project. Once you’ve used up all of your floor space, it’s time to look up. Most warehouses have a great deal of vertical space that’s not being used, so they are paying for airspace above their crammed shelves. You can take advantage of that airspace by either extending your shelving upwards or building a mezzanine deck in your warehouse that offers more storage space on top. 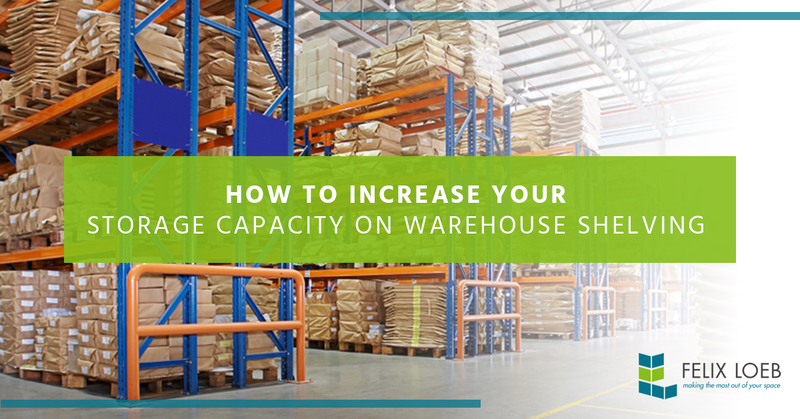 These methods can help you add up to 50% more storage space in your warehouse, and in some cases could even double it. Put seldom used items on those top shelves or free up more warehouse floor space by moving offices to the mezzanine level. How wide are your aisles? Are you leaving an aisle on both sides of your racks? You might be wasting precious floor space. Consider using a narrow aisle or very narrow aisle layout for your warehouse space and you’ll increase the amount of room that you have for shelving. Likewise, you might benefit from changing to a double deep racking layout, where you have two aisles of shelving back-to-back. You’ll still be able to reach everything but you will end up removing about half of your aisles, giving you more room for racks. Use containers that are the right size. How are you storing small items and cartons? If you are simply storage everything on pallet racks, you are wasting an enormous amount of space. It might be time to remove some of your pallet racks and look for other shelving options. When you store items on pallet shelving, you end up wasting all of the space around those items. That’s space that could be used elsewhere in the warehouse for storage. Look for carton flow racks or small item storage solutions instead. Use the right kind of shelving. Not all warehouse shelving is made equally. You may be using a kind that’s not as efficient for what you need to store. For instance, items like PVC pipe and lumber are best stored on cantilever racking; it takes up less space and allows easy access for order picking and processing. Speaking to warehouse layout or design professional may help you identify possible shelving solutions for your inventory. If you are running out of space frequently, it may be time to rethink your inventory strategy. You may be keeping too much in inventory at any given time, meaning you are paying to store items that you might not need. You might want to explore a “just in time” strategy that allows you to meet customer demand without paying to store too many additional items. A skilled supply chain manager should be able to help you analyze your inventory levels and find areas where you can afford to cut back. The Felix Loeb team can help! We’ve been working with warehouses in the Illinois area since 1928, helping them find the right warehouse shelving for all of their inventory needs. We offer great prices and fast shipping from our in-stock inventory supply. If you are in need of a new storage solution or want to upgrade your shelving, it’s time to talk to our team. Give us a call or contact us through our website to learn more about all of our shelving options and to find the one that’s right for your space!